Today’s post is, you guessed it, Valentine’s Day themed! But if you are looking for Candy Hearts and Chocolate Kisses, go elsewhere (except don’t, please stay…love me), because I have a less traditional approach. This post is based on a little game I made up to test your compatibility to your partner. 1-Toss a coin with your honey. Heads gets candy, tails gets the wine. 2-Part ways and choose wisely. No texting back and forth and no peeking! What would Cupid say? Lacking a perfect date for your new beau? Good thing you stumbled upon this blog. This is how the game went down for Sam & me. The wine is sweet, rich, and a bit tart (just like me right?). There’s a pleasant aftertaste, but it’s slightly too ripe for me. 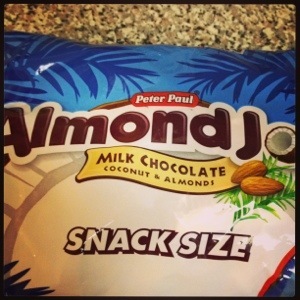 An Almond Joy is mostly chocolate and coconut at first. This combo mixes well with the Zin, but it doesn’t stand out as anything exceptional. The nuttiness of the almond adds a more diverse flavor palet. The pair is OK and I wouldn’t say no to it, but I think we can do better by coconut in the future. What does this say about our love? 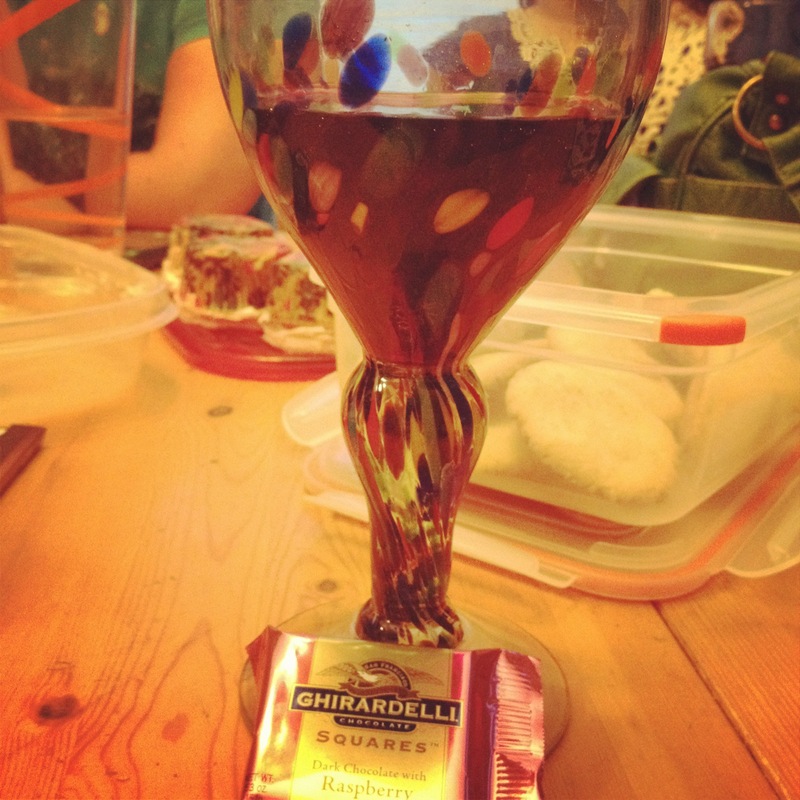 We both chose perfectly mediocre candy/wine with a mediocre result. What if I chose a $100 bottle or Sam chose a high-end candy? How out of sync would that be? 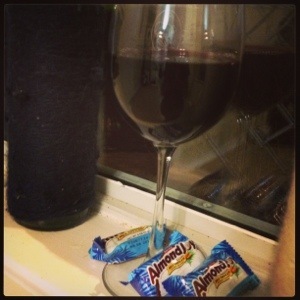 Posted in Zinfadel and tagged Almond Joy, chocolate, Valentine's Day, Zinfandel. Bookmark the permalink. I apologize again for the extremely long delay between posts. Summer is supposed to be a time of endless relaxing, or so I was told, but in real adult work must be done year round. And my work has been very hectic. At any rate, my post today will be a special pairing for the premiere of Dark Knight Rises. Yes, I realize that this movie premiered a week ago. Perhaps, you think, I should do a pairing for the premiere of the Olympics. And maybe I will (peach rings anyone?). But for now, we will deal with what we have, however belatedly. I asked my Twitter followers what I should pair the wine with for The Dark Knight Rises premiere and multiple people suggested dark chocolate. 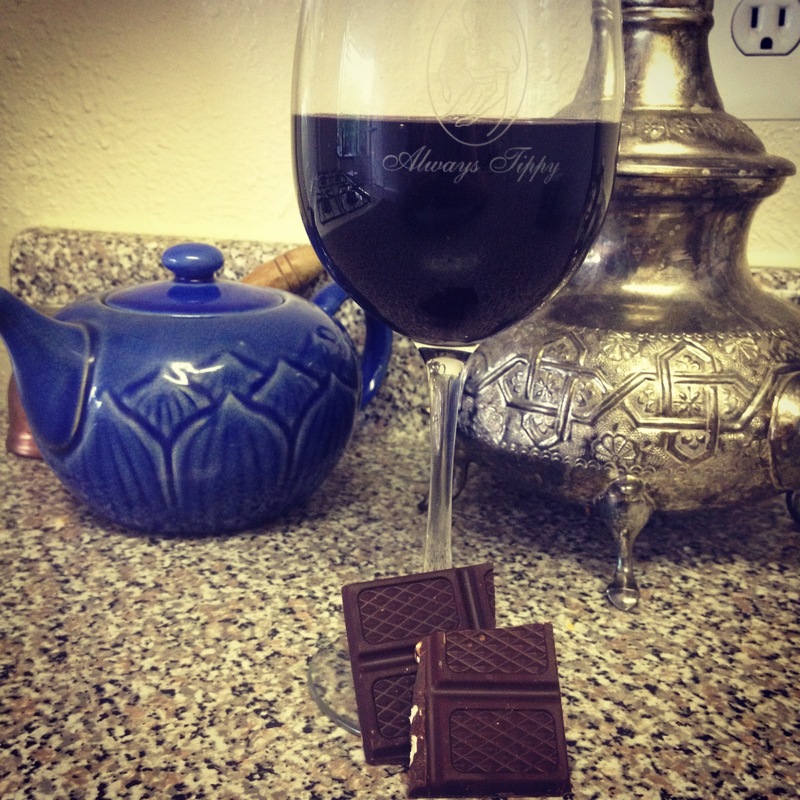 I’ll admit, I cringed a bit because pairing wine and chocolate is rather obvious. When considering my options though, dark chocolate is the best and only choice. It’s a great pick because it’s dark as well as complex. Really delicious dark chocolate contains many flavors and Batman is also a complicated character. He is civilian and vigilante, loved and hated by many, ordinary and extraordinary. So please, sit down and enjoy, and no spoilers in the comments please. Honestly, I did not plan this one out too much since dark chocolate and red wine is almost always good. Also, my chocolate needed to be soy free so my friend could go us. I grabbed the hazelnut to add some variety, which ultimately was the best chocolate. In terms of wine, I didn’t want anything too smokey or rich. I went with the zinfandel because of its fruit-centric flavor pallet. Some of you may notice this is Ravens Wood second appearance on this blog. I chose it because of the quality as well as the label. A black bird with wings is just about as close to a bat that I could get. Dark chocolate on the left. Hazelnut on the right. 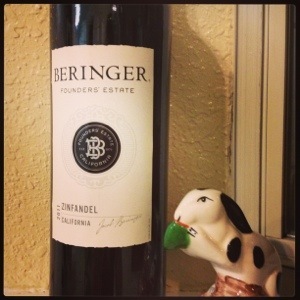 If you have not tasted this zinfandel, you really should do it right now. It is smooth and mild with a light citrusy taste. A slight smokiness is present, but it does not overwhelm the fruitiness. The flavors of boysenberry and strawberry are drawn out, staying with you until it finishes gracefully. The dark chocolates is very rich and has an espresso flavor to it which surprises me. It’s a very dark chocolate, so perhaps the bitterness reminds me of a good espresso. It’s also smooth and not too bold. Combined with the zin though, it lays a bit heavy on the tongue. It’s perfectly fine since it is a red wine and chocolate pairing, but it’s really nothing to write home about. The hazelnut, however, has the right combination of flavors. 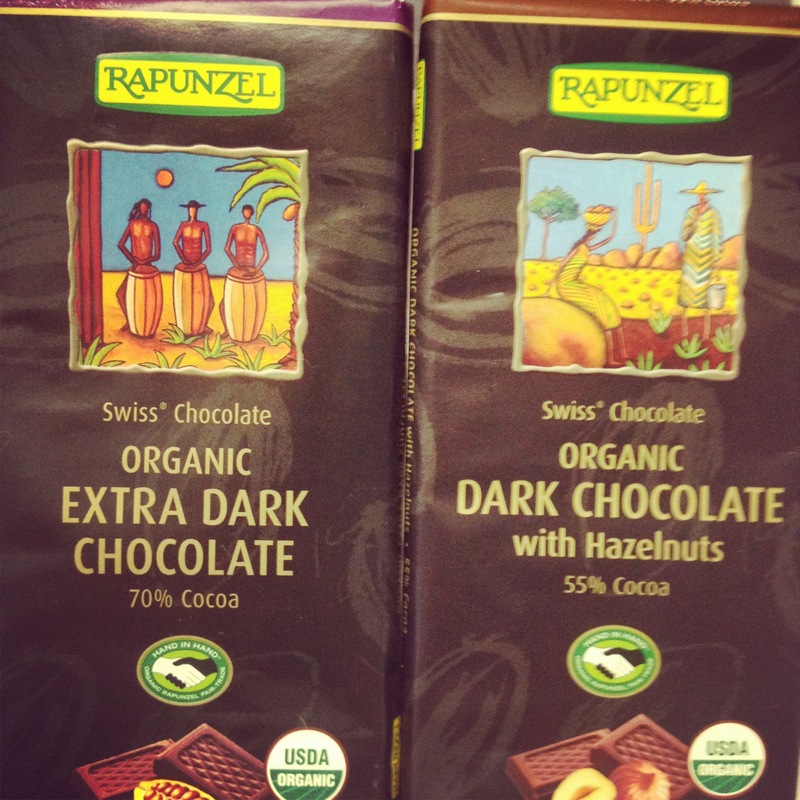 The hazelnut adds a unique sweetness to the dark chocolate, but it does not becomes overwhelming like milk chocolate. Each bite is a little different since the hazelnut is distributed unevenly. The zin is refreshing and maintains its integrity when sipped with this chocolate. I have inspired myself to do an Olympics themed post, so hold onto your medals and mount your dressage horse. Go (insert your country here) ! Posted in Zinfadel and tagged Batman, Dark Chocolate, Dark Knight Rises, Rapunzel, Ravens Wood, wine pairing, Zinfandel. Bookmark the permalink. I did this pairing a week ago and I thought I could get it posted by Monday. But it turns out I have a job as well as a blog and it just didn’t happen last week. I hope you forgive me. To make up for my absence, I have an excellent pairing for you. As you may remember, I paired it with the premier of True Blood. With the second episode airing tonight, I am not too off base. If you don’t know the show, that’s ok because watching it is not a prerequisite for enjoying this pairing. I like the idea of TV pairings because TV and wine already go well together. Add some candy in the mix and you have an excellent night. As some of you may remember, I blogged during the season premier of Mad Men. Your next TV pair will most likely be for Breaking Bad (rock candy, anyone?). Hopefully you’ll catch this post before the next episode of True Blood. If not, we have a whole, bloody season ahead of us. Last season featured some religious figures behaving very badly…the wine was a natural choice. For a show about vamps, having a candy with a red filling was a natural choice. The chocolate with red filling of any variety was the basis for this pairing. The “bloody” factor. Originally, I wanted chocolate covered cherries but I couldn’t find them (I only looked two places–oops). That little accident ended up being a happy one. In terms of wine, a zinfadel instantly came to mind. It’s fruity with a deep, strong flavored while maintaining a lighter quality. Boyfriend’s family love zin so I know it fairly well. The time was up for ignoring my zin. Obviously, this glass is amazing. There a moments when I’m doing this blog where I am filled with false confidence. I think, wow, I’m super good at this. I had one of these moments with this pairing. I was with people I just met, so having this work felt really good. The zin has a light sweetness and a slight tang. It does not go down smoothly, but it’s full, rich flavor makes up for it. Some wines are meals unto themselves whereas others are a perfect pairing wine. This wine was the later. It’s a great summer wine, light while still flavorful. The chocolate is pretty much what you would expect. 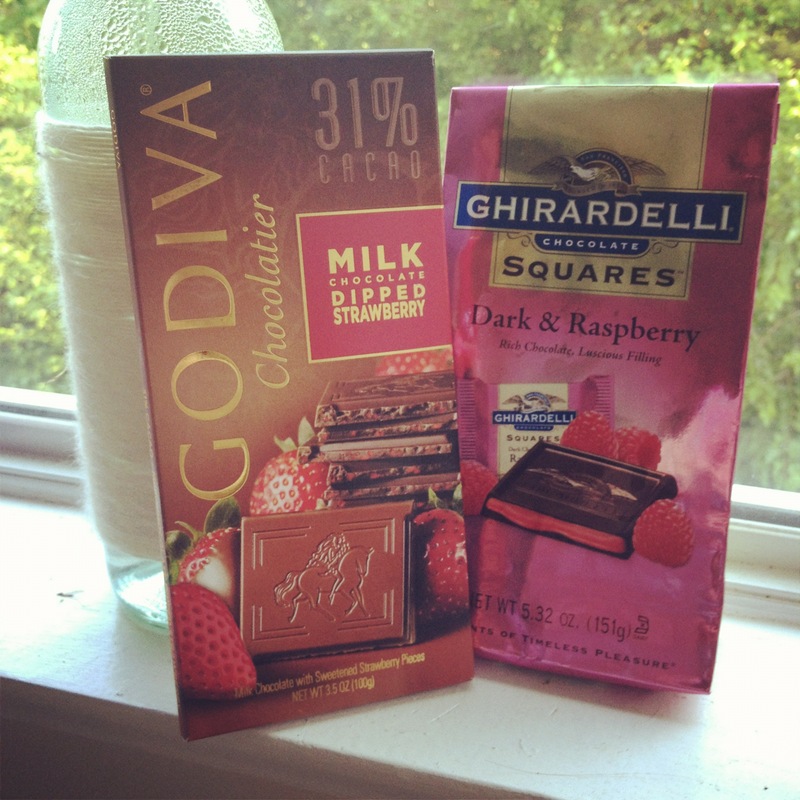 I need to start doing some edgy candy, but I put the shopping off so Ghiradelli and Godiva it is. The dark chocolate I liked the best, since it’s so rich and the raspberry is a tangy surprise. It pairs really well with the wine since each has a very simple pallet and they compliment each other. The rich chocolate with the tangy center compliments the full flavored wine. Since the chocolate isn’t very sweet, I can still enjoy the sweetness of the zin. The Godiva I don’t like very much since it is milk chocolate. I just don’t like milk chocolate. It feels too sweet and the strawberries are rather meager. I hate to pair milk chocolate since I already dislike it, but I wanted to provide variety. It certainly isn’t terrible and a friend enjoyed the pairing. I think the wine had such full flavor that it overpowered the meager milk chocolate. I will be going on a real vacation soon. I can’t promise a pairing in the near future, since I’ll be prepping for going away and then I’ll be gone. I’ll also be away from the Internet. I’ll try to scrounge something up, but no promises. Posted in Zinfadel and tagged Candy, chocolate, ghiradelli, godiva, raspberry, strawberry, t, true blood, wine pairing, zinfadel. Bookmark the permalink.